Our horizontal CO2-Storage Tanks are built to store liquid CO2 at a temperature below 0°C under pressure between 12 to 22 bar. Due to the low temperature of liquid CO2, the pressure will remain stable using a 100mm polyurethane foam with a protective aluminium jacket, white painted. These storage tanks are built on a rigid steel base frame for easy transportation and fast installation. Wherever local height conditions will not allow an installation of vertical CO2-Storage Tanks, this is the right solution. 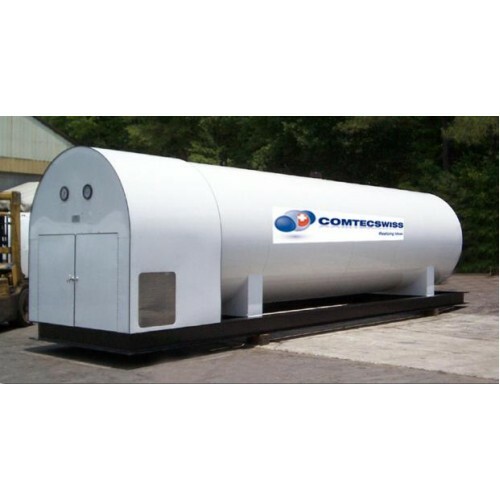 The complete tank will arrive factory tested and with a all pipework, valves, transfer pump and refrigeration unit all located in the front cabinet with lockable doors. Important to be mentioned is, that this CO2-Tank is equipped with an inner vessel made in low temperature steel for the use with CO2. This high quality execution will ensure an everlasting quality and maintenance free operation. We do also manufacture such tanks with a inner vessel in stainless steel if requested. Please contanct us and we will be pleased to help.